Contest: Win a 17" Black Walnut Live Edge Gift Set or Cutting Board. Win a 17" Black Walnut Live Edge Gift Set or Cutting Board. 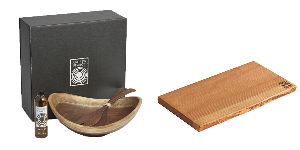 Prize: One grand prize winner will get a 17" Black Walnut Live Edge Gift Set. Five runner-up entries will win a Large Cherry Single Live Edge Cutting Board. Statistics: This contest was opened by 31 and entered by 2 ContestChest.com members. 6% of those who opened the contest, entered it.